The key to increasing R&D effectiveness and remaining competitive in today’s fast-paced scientific community is data integration. The ability to tap into multiple, heterogeneous data sources once and quickly retrieve clear, consistent information is critical to uncovering correlations and insights that lead to the discovery of new drugs and medical products. 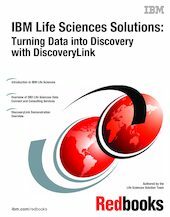 To meet the challenges of integrating and analyzing diverse scientific data from the variety of domains within life sciences, IBM has developed a versatile platform solution--IBM DiscoveryLink. With single query data access, the IBM DiscoveryLink software allows researchers to work with distributed data sources and diverse data formats. IBM DB2 Universal Database, the industry’s first multimedia, Web-ready, federated database, provides the industry-leading performance and scalability required to drive the most demanding life sciences applications. To ensure robust performance and fast response time, DiscoveryLink includes query optimization technology that automatically searches for the most efficient means of executing the query and assembling the results. With a single Structured Query Language (SQL) command, researchers can access and integrate information from multiple data sources.